The Dutch precision technology community is built on cooperation and communication. 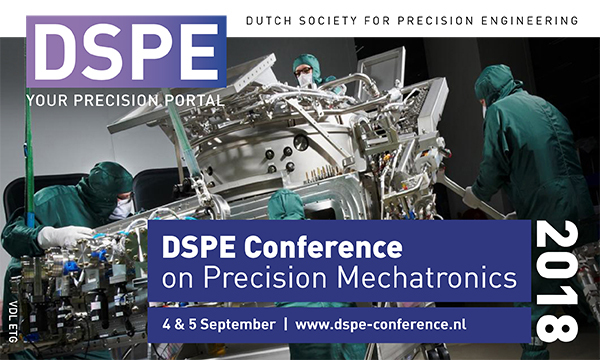 In order to allow the sharing of the available expertise and experience in the field of precision and control technology to continue, DSPE (Dutch Society for Precision Engineering) organizes the DSPE Conference on Precision Mechatronics every two years. The fourth edition is scheduled for 4 and 5 September 2018. The theme for 2018 is ‘Precision Imagineering’, the combination of precision, ‘imagination’ and ‘engineering’. A company can start with a dream or imagination, but engineering skills in the broadest sense of the word are needed to actually turn an early idea into a successful product, service or company. The deadline for submission of abstracts is February 1, 2018. This year’s theme ‘Precision Imagineering’ stands for the combination of Precision, Imagining and Engineering. It is inspired by the discussion in the Advisory Board that any successful business starts with a dream or with ‘Imagination’ but it takes ‘Engineering’ skills in the broadest meaning to actually transform the initial idea into a successful product and business. When it comes to precision engineering products it is evident that one needs to master the various aspects of precision engineering (design principles, dynamics, control, thermal aspects, contamination, …) in great depth. But the development of modern mechatronic devices, like IC equipment, electron microscopes, harvesting robots or medical robots for eye surgery, also requires mastering the art of managing complexity by applying systems engineering and having a keen eye on the growing importance of software and the possibilities and challenges that new developments such as artificial intelligence and deep learning offer to the precision engineering community. In line with the above DSPE strive to extend the traditional core topics of the conference with a session about software and systems engineering aspects in the development of precision equipment and the conference will be open to members of the SASG (System Architecting Study Group). Also they will select the guest speakers in line with the conference’ focus. With three guest speakers, 21 oral presentations and hopefully many posters and demonstrations, and a social event there will be plenty of food for thought, discussion and networking. Areas of interest include (but are not limited to): pm-stability, disruptive technologies & approaches, additive manufacturing, topology optimization, new materials, design principles, sensors, actuators, metrology, imaging technology, thermal design, vacuum & contamination, motion control, dynamics & acoustics, reliability, energy efficiency, machine specs vs. user needs, new business, value creation, open innovation. The 4th DSPE conference on precision mechatronics, which will take place on September 4-5, 2018 at the inspiring conference location De Ruwenberg in Sint Michielsgestel, The Netherlands.